Gordon's STEM Blog: A Great 2008 NCTT Winter Conference! We held our National Center for Telecommunications Technologies (NCTT) Conference at Orange Coast College in Costa Mesa, CA this past Friday and Saturday. At the conference we had 28 different presenters with sessions ranging in topic from Virtual Worlds to Internet2. It's always great to get together with our partners, see old friends and make new ones. The quality of the presentations was just incredible. I feel so fortunate to know and associate with such a strong group of dedicated faculty and administrators. I photo blogged the sessions and the conference using my iPhone and Tumblr which was an interesting experience that I'll write about later this week. You can see the photos if you scroll down the left hand column of this blog page and you can also find them at http://gsnyder.tumblr.com. 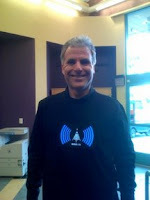 One of my favorite photos is of Professor Bill Saichek from Orange Coast College in the WiFi Finder t-shirt he won in the end of conference raffle - I've included it here. We not only learned a lot of new things, we also had a lot of fun - always a great combination! I want to thank Dr Ann Beheler, the Convergence Technology Center at Collin County Community College and Orange Coast College for hosting, helping set up and coordinating this incredible conference. Mark your calendars for July 28-29 in Austin, Texas for our summer conference. Details to follow and email me at gordonfsnyder@gmail.com if you are interested in presenting or attending. I'll get back on a regular blogging schedule now that the holidays and our winter conference are over.